A number of attributes are available to user entries. Some are set manually and some are set based on defaults if a specific value is not set. 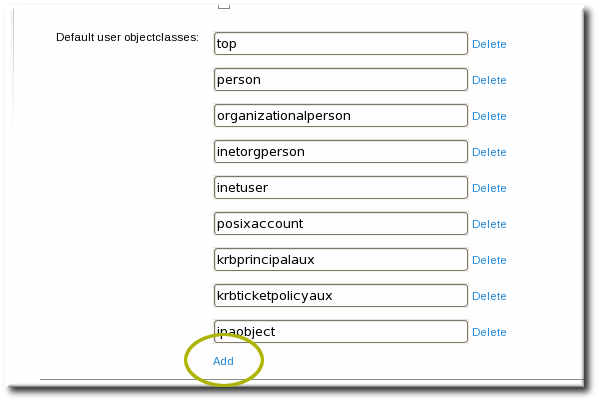 There is also an option to add any attributes available in the object classes in Table 9.1, “Default Identity Management User Object Classes”, even if there is not a UI or command-line argument for that attribute. Additionally, the values generated or used by the default attributes can be configured, as in Section 9.10.4, “Specifying Default User and Group Attributes”. [a] Required attributes must be set for every entry. Optional attributes may be set, while default attributes are automatically added with a pre-defined value unless a specific value is given. [b] The script prompts for the new password, rather than accepting a value with the argument. [c] When a user is created without specifying a UID number, then the user account is automatically assigned an ID number that is next available in the server or replica range. (Number ranges are described more in Section 9.9, “Managing Unique UID and GID Number Assignments”.) 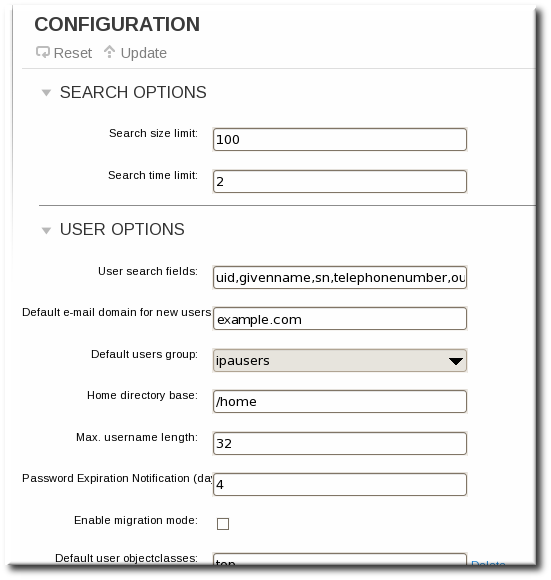 This means that a user always has a unique number for its UID number and, if configured, for its private group. It is possible to add or change the object classes and attributes used for user and group entries (Section 9.10, “Managing User and Group Schema”). All of the object classes and their specified attributes must be known to the LDAP server. All default attributes that are configured for the entry must be supported by the configured object classes. There are limits to the IdM schema validation, however. Most important, the IdM server does not check that the defined user or group object classes contain all of the required object classes for IdM entries. For example, all IdM entries require the ipaobject object class. However, when the user or group schema is changed, the server does not check to make sure that this object class is included; if the object class is accidentally deleted, then future entry add operations will fail. Also, all object class changes are atomic, not incremental. The entire list of default object classes has to be defined every time there is a change. For example, a company may create a custom object class to store employee information like birthdays and employment start dates. The administrator cannot simply add the custom object class to the list; he must set the entire list of current default object classes plus the new object class. The existing default object classes must always be included when the configuration is updated. Otherwise, the current settings will be overwritten, which causes serious performance problems. User and group accounts are created with a pre-defined set of LDAP object classes applied to the entry. Any attributes which belong to the object class can be added to the user entry. While the standard and IdM-specific LDAP object classes will cover most deployment scenarios, administrators may have custom object classes with custom attributes which should be applied to user entries. 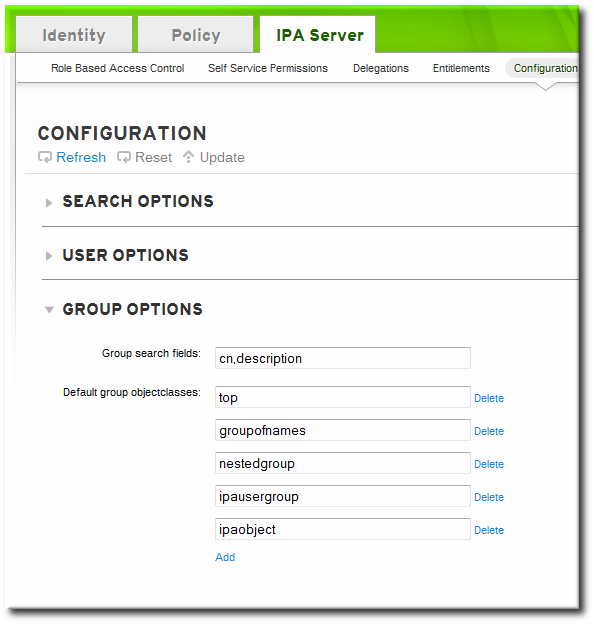 Add all of the custom schema elements to the 389 Directory Server instance used by Identity Management. Adding schema elements is described in the schema chapter of the Directory Server Administrator's Guide. At the bottom of the users area, click the Add link to add a new field for another object class. Always include the existing default object classes when the configuration is updated. Otherwise, the current settings will be overwritten. If any object classes required by Identity Management are not included, then subsequent attempts to add an entry will fail with object class violations. Add the new object class to the list of object classes added to entries. The option for user object classes is --userobjectclasses. As with user entries, administrators may have custom object classes with custom attributes which should be applied to group entries. These can be added automatically by adding the object classes to the IdM server configuration. Click the Add link to add a new field for another object class. Add the new object class to the list of object classes added to entries. The option for group object classes is --groupobjectclasses. Identity Management uses a template when it creates new entries. For users, the template is very specific. Identity Management uses default values for several core attributes for IdM user accounts. These defaults can define actual values for user account attributes (such as the home directory location) or it can define the format of attribute values, such as the username length. These settings also define the object classes assigned to users. For groups, the template only defines the assigned object classes. These default definitions are all contained in a single configuration entry for the IdM server, cn=ipaconfig,cn=etc,dc=example,dc=com. 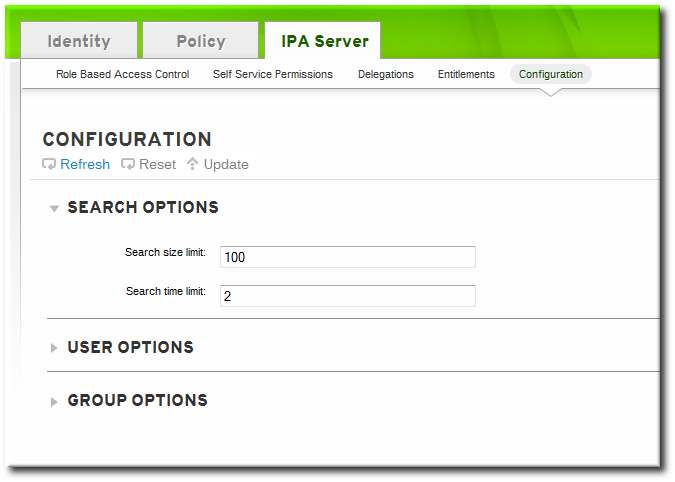 The configuration can be changed using the ipa config-mod command. Maximum username length --maxusername Sets the maximum number of characters for usernames. The default value is eight. Root for home directories --homedirectory Sets the default directory to use for user home directories. The default value is /home. Default shell --defaultshell Sets the default shell to use for users. The default value is /bin/sh. Default user group --defaultgroup Sets the default group to which all newly created accounts are added. The default value is ipausers, which is automatically created during the IdM server installation process. Default e-mail domain --emaildomain Sets the email domain to use to create email addresses based on the new accounts. The default is the IdM server domain. Search time limit --searchtimelimit Sets the maximum amount of time, in seconds, to spend on a search before the server returns results. Search size limit --searchrecordslimit Sets the maximum number of records to return in a search. User search fields --usersearch Sets the fields in a user entry that can be used as a search string. Any attribute listed has an index kept for that attribute, so setting too many attributes could affect server performance. Group search fields --groupsearch Sets the fields in a group entry that can be used as a search string. Certificate subject base Sets the base DN to use when creating subject DNs for client certificates. This is configured when the server is set up. Default user object classes --userobjectclasses Sets a list of object classes that are used to create IdM user accounts. Default group object classes --groupobjectclasses Sets a list of object classes that are used to create IdM group accounts. Password expiration notification --pwdexpnotify Sets how long, in days, before a password expires for the server to send a notification. Password plug-in features Sets the format of passwords that are allowed for users. The complete configuration entry is shown in three sections, one for all search limits, one for user templates, and one for group templates. The config-show command shows the current configuration which applies to all new user accounts. By default, only the most common attributes are displayed; use the --all option to show the complete configuration.